Building a Career as 'Bush's Brain' Karl Rove is known as "Bush's brain." Perhaps no other White House figure except the president himself has done more to shape the legacy of the Bush administration than has Rove. Karl Rove, deputy chief of staff and senior adviser, is emotional as he announces that he is leaving the White House at the end of the month. Perhaps no other White House figure but the president himself has done more to shape the legacy of the Bush administration than has Karl Rove. The man often described as "Bush's brain" has been a lightning rod for the administration's detractors. In October 2006, The New York Times wrote that "no political figure is more vital to the self-esteem of the Democratic Party and its faithful than Karl Rove." He has "provided sweet relief for Democrats otherwise ill equipped to explain Bush's successes," the Times wrote. "For the president's critics, it is axiomatic that Rove is supremely diabolical and inscrutably brilliant, since they're also pretty sure the president himself is neither." Rove's meteoric rise as a Republican strategist was marked out early, as he began forging a network of like-minded Young Turks who also subscribed to his take-no-prisoners style of campaigning. In an early example in 1970, Rove – then just 19 — infiltrated the campaign of Democrat Alan Dixon, who was running for Illinois treasurer. Rove worked for Dixon's rival. Swiping official letterhead, he printed 1,000 fliers promising "free beer, free food, girls and a good time" to anyone attending an upcoming Dixon rally. Rove then had the leaflets handed out in Chicago's seedier districts, prompting an unseemly turnout at the event. Years later, in a newspaper interview, Rove described the stunt as "a youthful prank" that he regretted. Rove attended several universities, including the University of Utah, George Mason University and the University of Texas at Austin, but he never earned a degree. It was at George Mason that he became active in College Republicans. In 1973, he launched a bid for the leadership of the national organization, with an equally young Lee Atwater as his campaign manager. After leading a split in the organization to cut out a rival, Rove won the campaign and attracted the attention of George H.W. Bush, who was then chairman of the Republican National Committee. That began a relationship with the Bush family that continues to this day. In 1977, Rove secured a position as executive director of the Fund for Limited Government, a Houston-based political action committee led by James A. Baker III, who later served as treasury secretary and chief of staff for Ronald Reagan before becoming secretary of state in the first Bush administration. That same year, Rove was hired by George H.W. Bush for his ultimately unsuccessful 1980 presidential bid. 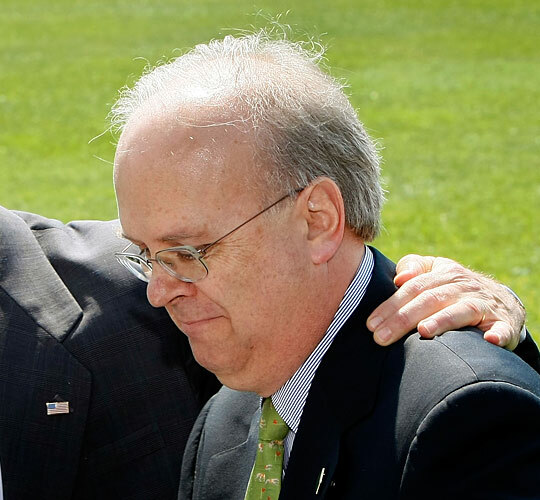 When Bush was chosen as Ronald Reagan's running-mate, Rove was folded into the campaign. Before Reagan won the White House, however, Rove was fired for leaking information to the media. Concurrent with his time in the Reagan-Bush campaign, Rove helped Bill Clements Jr. defeat scandal-plagued incumbent Democrat Dolph Briscoe to become the first Republican governor of Texas in more than a century. Over the next few years, Rove helped Clements win re-election and helped Phil Gramm win House and Senate campaigns from Texas. Despite leaving under a cloud in 1980, Rove was called back for the 1984 Reagan-Bush re-election bid, where he oversaw direct-mail strategy. It was during the Clements re-election campaign that Rove drafted a memo that has since become synonymous with his strategy. In it, he quotes French Gen. Napoleon Bonaparte, advising candidates to put forth "a well-reasoned and extremely circumspect defensive, [sic] followed by rapid and audacious attack." In the late 1980s, Rove concentrated on electing Republicans to the Texas Supreme Court. By 1993, he succeeded at convincing George W. Bush to run against incumbent Texas Gov. Ann Richards. Bush won an upset victory using Rove's strategy of staying focused on four key issues: juvenile justice, tort reform, welfare reform and education. After helping secure a second term as governor for his boss in 1998, Rove began planning for Mr. Bush's White House run. After Mr. Bush's narrow and controversial 2000 White House victory, Rove defied conventional wisdom in 2004 by ignoring the safe middle ground, instead aiming to solidify the president's religious-right base. By contrast, Rove seemed to refuse to embrace the reality that Republicans would be badly beaten in the 2006 midterm elections, as the Iraq war took a toll on the national psyche and Bush's approval ratings went steadily down. 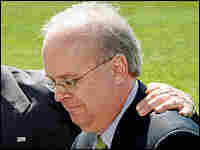 In an Oct. 23, 2006, interview with The Washington Times, Rove said he was "confident we're going to keep the Senate. I'm confident we're going to keep the House." After the Republicans' stinging defeat in the 2006 elections, Rove became embroiled in a pair of scandals that have dogged the White House. The first was the leak of undercover CIA agent Valerie Plame's identity to the media. While Rove himself was not prosecuted for the leak, he testified before a federal grand jury that eventually led to the conviction of White House aide I. Lewis "Scooter" Libby on charges of perjury and obstruction of justice. At the beginning of Libby's trial, his attorneys said their client was the victim of a conspiracy to protect Rove, though details of such a plot never materialized. Rove has also been connected with the ongoing dispute over the firing of federal prosecutors by Attorney General Alberto Gonzales. The White House claimed executive privilege in its effort to keep Rove from testifying on the matter before the Senate Judiciary Committee. While Rove's role was largely as a political tactician for Mr. Bush, for a time, he also took on responsibility for promoting policy goals. He played an integral role in the White House Iraq Group, a team of top advisers that helped the administration communicate the case for war to the American people. "I will miss, deeply miss, my work here," an emotional Rove said Monday at a news conference with Mr. Bush. "Mr. President, I'm grateful for the opportunity you gave me to serve our nation. I'm grateful to have been a witness to history."